The international bestseller that has sold over 10 million copies worldwide. The Elegance of the Hedgehog is a moving, funny, atmospheric novel that exalts the quiet victories of the inconspicuous among us. We are in an elegant hôtel particulier in the center of Paris. Renée, the building's concierge, is short, ugly, and plump. She has bunions on her feet. She is cantankerous and addicted to television soaps. Her only genuine attachment is to her cat, Leo. In short, she is everything society expects from a concierge at a bourgeois building in a posh Parisian neighborhood. But Renée has a secret: she is a ferocious autodidact who furtively devours art, philosophy, music, and Japanese culture. With biting humor she scrutinizes the lives of the building's tenants—her inferiors in every way except that of material wealth. Then there's Paloma, a super-smart twelve-year-old and the youngest daughter of the Josses, who live on the fifth floor. Talented, precocious, and startingly lucid, she has come to terms with life's seeming futility and has decided to end her own on the day of her thirteenth birthday. Until then she will continue hiding her extraordinary intelligence behind a mask of mediocrity, acting the part of an average pre-teen high on pop subculture, a good but not an outstanding student, an obedient if obstinate daughter. Paloma and Renée hide both their true talents and their finest qualities from a world they suspect cannot or will not appreciate them. They discover their kindred souls when a wealthy Japanese man named Ozu arrives in the building. Only he is able to gain Paloma's trust and to see through Renée's timeworn disguise to the secret that haunts her. Muriel Barbery is the author of the New York Times bestseller, The Elegance of the Hedgehog (Europa, 2008), and Gourmet Rhapsody (Europa, 2009). She has lived in Kyoto, Amsterdam and now lives in the French countryside. Alison Anderson's translations for Europa Editions include novels by Sélim Nassib, Amélie Nothomb, and Eric-Emmanuel Schmitt. She is the translator of The Elegance of the Hedgehog (Europa, 2008) and The Life of the Elves (Europa, 2016) by Muriel Barbery. "Gently satirical, exceptionally winning and inevitably bitersweet." "The Elegance of the Hedgehog is about love. But not the sappy, head-over-heels variety. Rather, it's about the love of one's friends. It's about the love you can experience when you connect with strangers. And it's about the possibility—but just that—of romantic love." "Both [of the book's protagonists] create eloquent little essays on time, beauty and the meaning of life, Renée with the erudition and Paloma with adolescent brio." "Astute social satire and abstruse German philosophy are rarely found together, but here they are in this ingenious work of fiction." "In this supple novel of ideas, a best-seller in France...two autodidacts share an allergy to grammatical errors (the concierge considers a misplaced comma an 'underhanded attack') and a love of tea and moments of ineffable beauty. Barbery's sly wit, which bestows lightness on the most ponderous cogitations, keeps her tale aloft." "This fable of love, frienship and the beauty of art not only gives innocence a voice, but also shows what a powerful novel can do: transport, educate and, ultimately, console." "The Elegance of the Hedgehog is a high-wire performance." 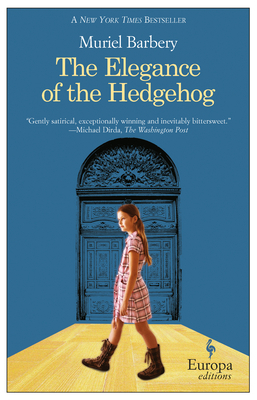 "[The Elegance of the Hedgehog tells] a beautiful story with a large cast of fascinating, complicated characters whose behavior is delightfully unpredictable...No idea is too big or small to find a home in the Parisian apartment building where most of the characters live." "This dark but redemptive novel, an international bestseller, marks the English debut of Normandy philosophy professor Barbery...By turns very funny (particularly in Paloma's sections) and heartbreaking, Barbery never allows either of her dour narrators to get too cerebral or too sentimental. Her simple plot and sudden denouement add up to a great deal more than the sum of their parts." "Hedgehog is really an international book, focused as it is on universal topics of childhood, philosophy, love, and art." "This story, like all great tales, will break your heart, but it will also make you realize—or remember—that sometimes the pain is worth it."